This area of the kitchen is very naked in anticipation of our open shelves. Ok, and an outlet cover. I know, that is silly. The shelf boards are from a local hardwoods place I found online. They were able to cut down the oak to the exact measurements I wanted, so I got two oak shelves 42 inches long, 11.5 inches deep, and 1.75 inches thick. They are so beefy! I paid $124 for both pieces and couldn't be happier. 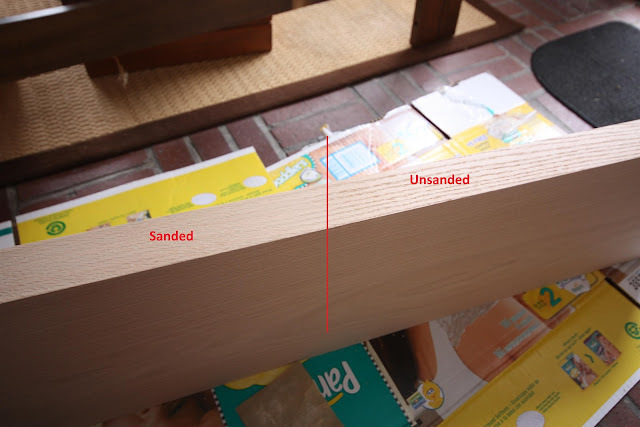 Piecing a thick oak shelf together at the local big box store would've been a pain and would not have looked as nice. They did need a finish sand before staining. Especially on the edges....see the difference? I picked the stain up from our local Hallman Lindsay store. I thought about painted shelves way back, but I really wanted more warmth in the kitchen, so I went with red oak with a plan to stain to match the floors. The American Walnut stain was a near perfect match for the floors, tested here on a scrap piece of flooring. Fabulous! I wanted to only do one coat of stain, and I'm very happy with the color with just one pass. I didn't let it sit, I just applied and wiped it smooth right away. Gorgeous! The knot on this one will most likely be the top part of the top shelf, so no one will see it. Although, I don't actually mind it. The shelf brackets were really annoying to stain, but I got the job done with the help of some Q-tips for the tight areas. These four brackets from architecturaldepot.com cost me $125 and can hold 250 pounds. That's great, considering how heavy the boards are alone! The next step is to coat all the pieces with my favorite finish for stained wood, Deft spray lacquer. I think I will use semi-gloss for this application. This lacquer is so durable, our dining room table still looks newly refinished a year and a half later. Love the shelves - can't wait to see them up. It's looking fantastic. I can hardly wait to see the shelves installed. The wall color looks so drastically different on my screen today. They look very gray compared to the other kitchen pictures I've seen-crazy! Love the wood! I think it will look so fab in the kitchen and stain was the way to go! I love that you stained them rather than painting -- you're right, they'll tie in beautifully with the floors and add lots of warmth. Plus, they'll likely make whatever you place on them really stand out! I love the wood tones on the shelves! They are going to look amazing and the wood tones really pop after the stain. I've never heard of this deft, but I'm adding it to my growing arsenal of things Russet Street taught me.